Human intelligence is among the most powerful forces on earth. It builds sprawling cities, vast cornfields and coffee plantations, complex microchips; it takes us from the atom to the limits of the universe. Understanding how brains build intelligence is among the most fascinating challenges of modern science. How does the biological brain, a collection of billions of cells, enable us to do things no other species can do? In this book John Duncan, a scientist who has spent thirty years studying the human brain, offers an adventure story - the story of the hunt for basic principles of human intelligence, behaviour, and thought. 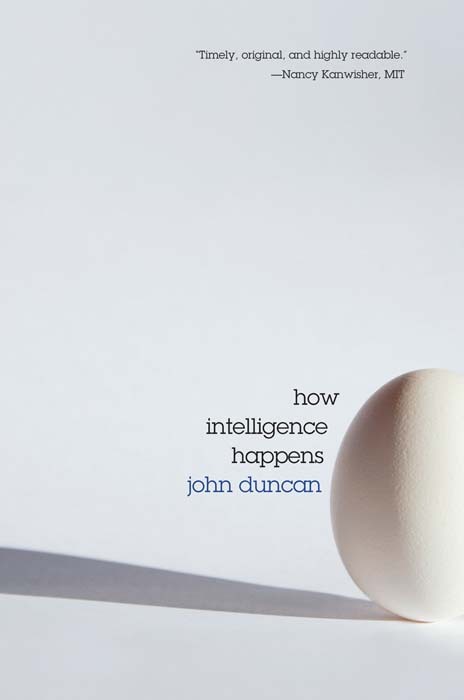 Using results drawn from classical studies of intelligence testing; from attempts to build computers that think; from studies of how minds change after brain damage; from modern discoveries of brain imaging; and from groundbreaking recent research, Duncan synthesizes often difficult-to-understand information into a book that will delight scientific and popular readers alike. He explains how brains break down problems into useful, solvable parts and then assemble these parts into the complex mental programmes of human thought and action. Moving from the foundations of psychology, artificial intelligence, and neuroscience to the most current scientific thinking, How Intelligence Happens is for all those curious to understand how their own mind works. John Duncan is assistant director of the MRC Cognition and Brain Sciences Unit in Cambridge, honorary professor of cognitive neuroscience at the Universities of Cambridge and Bangor, visiting professor at the University of Oxford, and fellow of the Royal Society and the British Academy. For the past thirty years, his research has focused on linking human mind to brain. He is known for his frontal-lobe theory of human intelligence, which has been covered in the media worldwide. He lives in a small village near Cambridge, U.K. In 2012 Prof. Duncan received the $150k Dr. A.H. Heineken Prize for Cognitive Science for his remarkable innovative, multidisciplinary research into the relationships between psychology, behaviour and intelligence on the one hand and neural processes on the other. His concepts have become a cornerstone of cognitive neuroscience.